or Juan Roti – sounds Spanish huh? I didn’t have barley flour, so just used strong bread flour. Flour is flour and if you don’t have the right one in, it’s as easy to adapt. I could have used gram flour. Chop the chillies and garlic in slivers. Up to you whether you take the seeds out of the chillies. I didn’t. I have no idea how much flour I used, I would guess say four ounces, a few drops of olive oil to moisten and make the dough malleable, and then add the potatoes. If you are used to making dough, you need it just moist enough to leave the sides of the bowl and form a nice kneadable consistency. Wrap in greaseproof and leave in fridge until ready to use. Can be frozen. Julia Sahni gives some complicated instructions about how to roll these out, but basically, I divided up the dough into small balls that would fit in the frying pan when flattened. I didn’t bother with a rolling pin as I tend to flatten small Indian breads with my hands. Saves on the washing up if nothing else. I did add oil to the pan from time to time. But not much. I’m not clever enough to put the right amount of oil in the dough to dry fry. So this is the cheating cook’s method. I didn’t keep them warm in a tea towel or add melted butter although you can do that if you wish (note flour and butter and tea-towels = mess). I did keep cooking them while we were eating. Put one bread in, dish it up, add another, and by the time the first one is eaten another one is ready. Easy. And extremely tasty. If you are used to making breads of whatever type, then you don’t need the quantities. If you aren’t then I suggest you pro-rata this lot down as I had enough for two lots of meals, and I certainly didn’t use 10 ozs of flour. The above recipe will make 24 x 6 inch rounds. Mine made 8 breads. This is an interesting recipe…the potatoes make me think of a kind of baji more than a bread, though I’ll have to try it. I’m curious about the ratio of flour to potatoes – you say you used about 4 oz of flour in total? Which is about 1/4 cup (right? Even after 2&1/2 yrs in UK I didn’t get used to oz for measuring :) Yet the recipe calls for 10oz which is about a cup and 1/4…and 2 or 3 potatoes – looks like about a cup of smashed spuds (do you really have to get them drunk? or can you just whip them domina style? har har hardee har har…’smashed spuds’.) There is the glaring absence of a raising agent (I guess we don’t get them high…. :P ). So now that I’ve analyzed this recipe, I’m wondering if it is more like little tortillas than bread. What say you madam? BTW have risen from the web dead with a new iMac. :)) Well, new to me. Bought from a friend who has a new 2nd hand one. She treats computers well. Unlike meself who has a white MacBook the same age as her black one – and the difference in condition is like night and day : black and white…night and day…) Guess I shoulda bought a black one. Maybe mine would still look and run like hers. Like the new recipe section! No, defo a bread. 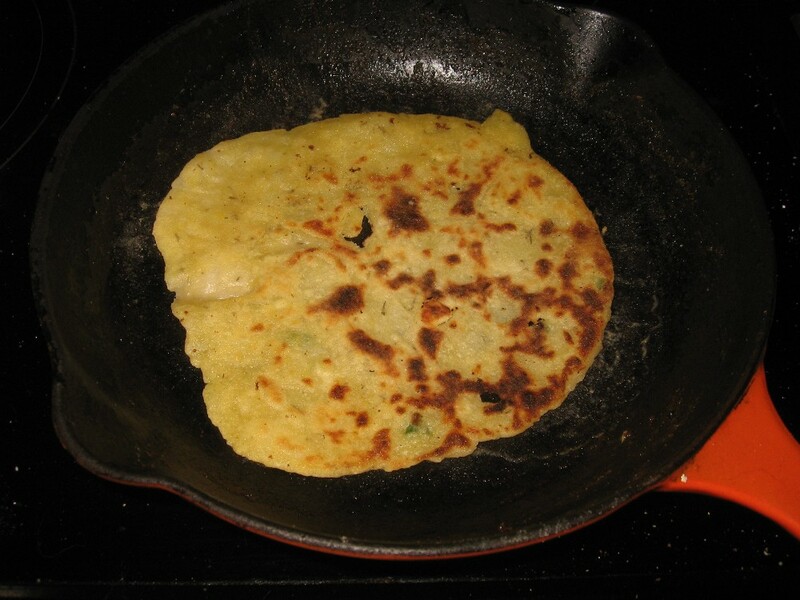 But more of a naan or a paratha, than a chappati/poppadom/roti (says the Indian expert chef!). Can’t help on American measurements. They floor me. (but not smashed). Actually I mash mine, rather than smash them. 2 or 3 potatoes is a lot, seriously, plus ten ozs of flour would leave you with bread for ever and a day! Mine is silver but it is an old pro. You don’t need to hear that. Just thought it continued your double entendre theme. Pleased you like it:) Trying to make it a mix of quick, cheap and easy (!) and somethings that are a bit different. Plus its obviously vegetarian, but if anyone hasn’t worked that out they are a bit slow off the mark. Tingled after reading this, I have just made some. I stuck exactly to your recipe, except for substituting rice flour for both flours, and chives and hot chili red pepper powder for the dill and chilis as that was the nearest I could get with the ingredients at home. :) Absolutely fabulous and so quick and easy. Thank you!